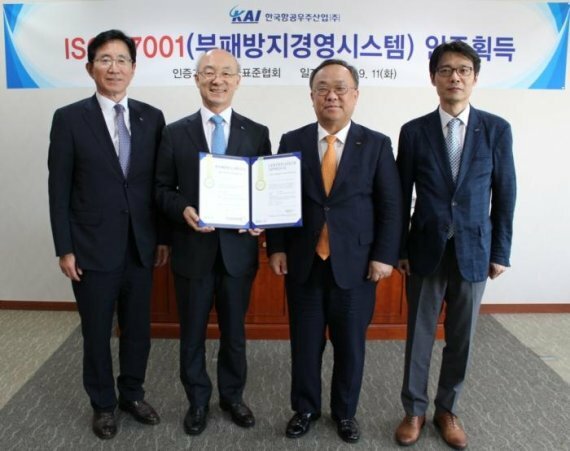 Korea Aerospace Industries said on Tuesday that it had acquired ISO 37001 certification, proof that its anti-bribery management systems meet international standards. It is the first time that this certification has been granted to any institution in the Korean national defense industry. The International Organization for Standardization adopted ISO 37001 in 2016. To be certified, companies must show they are equipped with appropriate, effective systems to prevent corruption and bribery. They must provide the required documentation and undergo on-site inspections by the Korean Standards Association. Beginning in April, Korea Aerospace Industries worked with external consultants to establish anti-bribery management systems that meet international standards. This process involved establishing a strategy, ensuring compliance with relevant laws, fostering leadership, developing appropriate evaluation programs and undertaking other activities to improve its systems. “We will practice systemic compliance and ethical management and fulfill our social responsibility at eye level with the public,” said Korea Aerospace Industries CEO Kim Jo-won at a certificate-awarding ceremony in Seoul. “The company will lead the way in raising the transparency of the local defense industry by operating the system in sync with global standards,” he added.